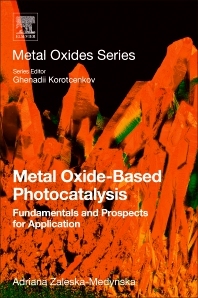 Metal Oxide-Based Photocatalysis: Fundamentals and Prospects for Application explains the principles and fundamentals of metal oxide-based photocatalysis and the requirements necessary for their use in photocatalysis. It also discusses preparation methods for photocatalysis, and the advantages, disadvantages and achievements of the most important metal oxides (TiO2, ZnO, Fe2O3, Ta2O3, CuO, NiO, Cr2O3, RuO2, etc.). The book concludes with the most important photocatalytic applications and an overview of the future. Applications are organized by potential needs and solutions, addressing such areas as water treatment, hydrogen production, air treatment, chemical synthesis, and applications in medicine and construction. Adriana Zaleska-Medynska is a Professor in Chemical Technology at the University of Gdansk and head of the Department of Environmental Technology. She obtained a Ph.D. in 2000 in the field of chemical technology at Gdansk University of Technology (Poland). Following appointment as Visiting Scientist at University of Utah (UT, USA) and California Institute of Technology (CA, USA), she was appointed as adjunct at Faculty of Chemistry at Gdansk University of Technology. During this time she started to study the correlation between surface properties and visible light induced photoactivity of TiO2-based materials. She completed D.Sc. (habilitation) in 2009 and in 2012 she became a head of the new research group at University of Gdansk followed by promotion to Full Professor at the same university in 2014. Her current interests concern functional material synthesis and characterization, heterogeneous photocatalysis, environmental technology, air treatment and nanotechnology. She is an author and co-author of 96 papers, 15 chapters in books and monographs, 14 patents, 4 patent applications, 147 short communications.